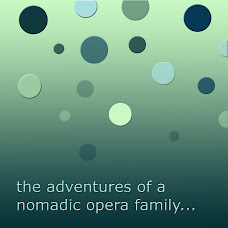 January: We started the year in Seattle for Brian's production of the Pearl Fishers with Seattle Opera. We enjoyed spending time with family and friends. We traveled directly to North Carolina at the end of the month (for a total of almost 3 months away from home). February: We appreciated the early Spring in Raleigh since we were in Seattle for their freak 12 inches of snow. Brian was in Opera Carolina's Cenerentola. A highlight for me was the show on Valentine's Day where I was seated on the end of the row with an empty seat right next to me. I am sure it looked like I have been stood up but I actually went home with Cinderella's Prince. We enjoyed the Southern hospitality of our old friend DanaLee. She was especially helpful to me when Brian had a concert in New York between Cenerentola shows and left me and the kids behind. March: The kids and I were home all month while Brian had concert work in both Milwaukee and Louisiana ( both Carmina Burana). Colin, Jane, and I enjoyed being close to our pediatrician since they got RSV. (He said I probably had it too, it was nice and miserable.) The end of March took us to Washington DC for a dear friend's wedding, the Cherry Blossom Festival, and wonderful times to see other friends. April: We arrived home from DC on April 4th and left for Honolulu on April 6th. Brian had a third Carmina Burana with the Honolulu Symphony (RIP, so sad). He only sings for about three minutes in the piece as a roasting swan. The lovely retired gentleman I sat next to in the concert had heard the piece live 7-8 times. He said he had never heard a tenor sing it as well as Brian did. We loved Hawaii as it exceeded our expectations. We spent an extra week up on the North Shore with some lovely friends. May: We were home for maybe two weeks and I had to go to Disneyland. We stayed with more lovely friends and we always love Disneyland. Brian spent a lot of time getting the garden in. Something in the garden tried to kill him by giving him a terrible infection in his knee. (Worst case scenario, he could have been in the hospital for 6 weeks, so said the Urgent Care doctor.) He had his last follow-up with an orthopedic doctor the same day we left for Princeton, NJ for the Princeton Festival. June: Brian had fun in the Princeton Festival's production of Britten's A Mid Summer Night's Dream. (It was a great show, hope Brian does more Britten.) We stayed in New Hope, PA in a 1830 lock keeper's stone house right on the Delaware River. We loved jogging on the tow path and enjoyed the nice people of New Hope and Princeton. We also spent a few of Brian's days off in Center City Philadelphia thanks to the Nuttall's generosity. We loved Philadelphia. July: We were home all month. Brian began a big remodeling of the basement and I had a great time with a herniated disk (pain way worse than natural childbirth). This was not my favorite month, but had a nice time for Brian's birthday. September: We traveled to the Seattle area for Brian's family reunion. We also found out that Brian had a last minute offer to sing with the Polish National Opera. We had less than 20 days between getting the contract and traveling to Poland. Jane got an expedited passport. She maybe has the cutest baby passport photo ever, or one of the cutest since Colin's is also very darling. Colin's photo has made very tough looking border control personel smile. October: We loved Warsaw and had a nice Polish Fall! We enjoyed mild weather (although a bit gray at times). We had an apartment in the Grand Theatre about 2 blocks from Old Town. November: Still in Poland, we loved going to the cemetery on All Soul's Day and traveled to Krakow with our friend Sue Anne. We made some very nice friends in Warsaw and have lovely memories. We got home two days before Thanksgiving. December: Home for the holidays, (minus Brian's one weekend away for a Messiah performance in Indianapolis). Early in the month Brian sang the tenor role in the Creation with Utah Opera and we enjoyed Brian getting paid to not travel. We had a great Christmas and are preparing to leave again in early January (Barber of Seville in Denver with Opera Colorado ). We know a lot of where we will be in 2010, but who knows? Holy cow it is a crazy life.